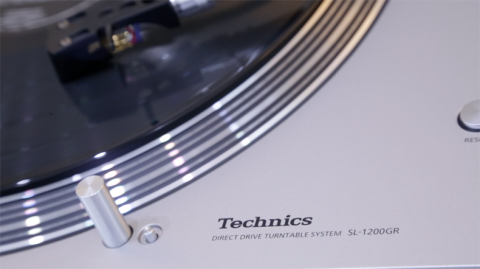 Technics SL-1200GR hands-on hands on review | What Hi-Fi? When Technics resurrected its SL1200 turntable last year as the SL1200G, the response was one of rhapsodic excitement tinged with horror at the unashamedly hefty price. Now, at CES 2017, the company has launched the SL1200GR, a ‘standard’ version of the SL1200G ‘premium’ model. There’s not much room for manoeuvre where the design of record players is concerned, and Technics has wisely decided to leave well enough alone with the SL1200GR. At a glance, it could be a deck from any time in the past three decades, with only the pitch control and stroboscope being any kind of departure from the record player norm. The Technics SL1200GR draws heavily on the technology of last year’s SL1200G. ‘Cogging’ (drive-motor rotation irregularity) is reduced by tweaking the magnet design inside the motor, and throughout its design the SL1200GR is as rigid and as efficiently damped as possible. The platter, for instance, is a two-layer design of die-cast aluminium and rubber, and is ribbed across its rear surface to increase stiffness and reduce unwanted resonance. The chassis the platter sits on is also a two-layer design, with silicon rubber, aluminium and microcell polymers all deployed in an effort to give class-leading damping characteristics and very high rigidity. The S-shaped tonearm (which is assembled, fitted and balanced by hand) is an aluminium tube, specified for its rigidity and low mass. The phono terminals and grounding terminal are gold-plated to keep interference from external noise to a minimum. And the sheer mass of the Technics SL1200GR goes some way to maximising its performance. Including the 2.5kg of the platter, the 1200GR weighs in at 13.7kg – down on the 21.6kg of the SL1200G. We heard the SL1200GR as the source of a system built from three new products Technics announced earlier this week. It goes without saying a Las Vegas hotel suite, complete with business meetings being conducted in at least two languages, is hardly the ideal environment in which to critically assess a record player – but even a five-minute listen (and a five-minute listen to Sting, at that) was enough for the SL1200GR to give a suggestion of its strengths and flavour. The deck’s most obvious characteristic during my brief listen seemed to be its rather unvinyl-like agility. There was none of the tiredness commonly associated with turntable-based systems – instead, the Technics set-up seemed to snap through the percussive noises with a decent sense of speed and directness. The attack and decay of high frequencies sounded promising, and down at the bottom end, the double-bass notes appeared to be deployed with similar speed and precision. The soundstage didn't seem the widest in the world, but it was relatively well-defined and easy to understand. A hands-on listen is not a review, of course, and the What Hi-Fi? judgement will be reserved until there’s a production sample in our testing rooms. Then there's the price of the player to take into consideration. Early estimates put the SL-1200GR at around the £1500 mark, so it also remains to be seen how the deck will fare in the value-for-money stakes. Keep your eyes peeled for our full review once the turntable launches later this year.